Anna Walker writes and illustrates children’s books and is based in Melbourne. Her charming studio is shared with a printmaker, Rosy the lamp, a few friendly plants, and knitted, woolly creatures. 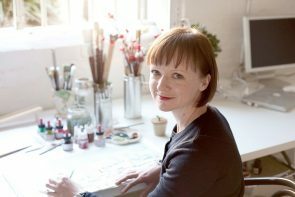 Working with pencil, ink and collage, Anna develops her characters and enjoys spending time with them before they venture out into the world. Her illustrations are inspired by the everyday details of life and the amusing antics of her menagerie. Anna’s latest book with Penguin is Mr Huff, an exploration of how kids deal the worrying feelings that can accompany a bad day.